Progressive Machine Co., Inc., introduces the Model 307 Cost Cutter, Core Cutter for the repeatable production of consistent, high quality cores. The 307 produces accurately cut, straight, parallel cores with dimensions held to thousandths of an inch and free from fray. 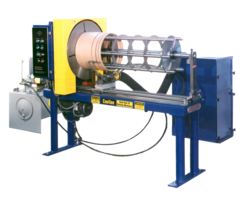 The Core Cutter produces better cores which, in turn produce better coils. The Model 307 utilizes a simple thumb wheel adjustment for setting core size and a microprocessor for storing parameters and actuating the system. The simple, easily accessible design provides durability with limited maintenance. Blade changes are easily accomplished in seconds rather than minutes. Safety, which is often an issue of concern with core cutters is prominently addressed in the design of the 307. The support arm interlock prevents starting unless the arm is secured in place and all belts and chucking are guarded. Additionally, the cutting assembly is located underneath the core arbor and away from the operator. The drive motor is equipped with a fail-safe brake that stops all rotating members on command. Note: Core Cutter as pictured configured for phenolic cores.